We never have had so much positive feedback as we have got with Slow, thank you for all the kind words. It’s more than appreciated ! 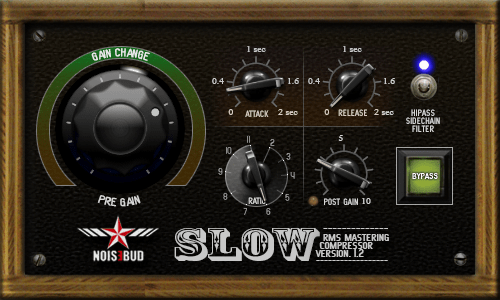 Slow is a RMS based leveling amp / compressor aimed for mastering but it can be very handy in production as well. It’s called slow because initially the attack and release was locked to 2 seconds, really slow, hence the name. As the plugin evolved we added an attack knob and in it’s latest incarnation we also let the release out in the open. It start to look like a normal compressor but you’ll soon notice that that is not the case. Slow does not just reduce the gain when the level is above a threshold, it will also increase the gain when the level is below. This make Slow one of a kind and the approach has shown that you can achieve transparent results quicker and with less hassle and surprises. Its intended use is for even out the level of a whole track but try it for sculpting bass drums, compress vocals or brass too, we tried it in lots of situation and got a bit amazed how well it performed.